A sweet, whimsical tale that chronicles the journey of a chair as it changes hands and uses. Perfect for fans of The Good Little Book, Something for Nothing and Virginia Lee Burton's The Little House. Boo's favorite chair is little and blue. He sits in it, reads in it and makes a tent around it...until the day he grows too big for it. His mother puts the little blue chair out on the lawn where a truck driver picks it up. The truck driver sells it to a lady in a junk store where it sits for many years until it's sold and put to use as a plant stand. 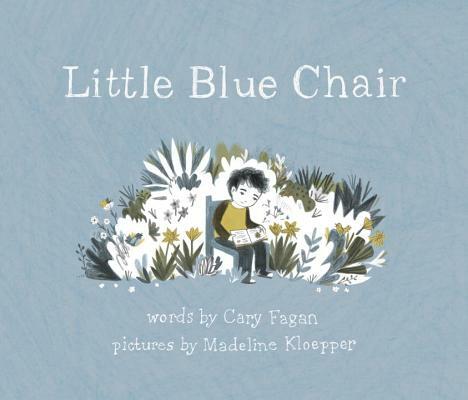 In the years that follow, the little blue chair is used in many other ways -- on an elephant ride, in a contest, on a Ferris wheel, in a tree...until the day it flies away, borne aloft by balloons, and lands in a garden of daffodils where a familiar face finds it. CARY FAGAN's kids' books include the popular Kaspar Snit novels, the two-volume Master Melville's Medicine Show and the picture books Thing-Thing, Ella May and the Wishing Stone and I Wish I Could Draw. Mr. Zinger's Hat, another of his picture books, was awarded the Marilyn Baillie Picture Book Award and the IODE Jean Throop Award. He recently won the Vicky Metcalf Award for Literature for Young People for his body of work. His books have been translated into nine languages. Cary is also the author of six novels and three story collections for adults. He was born and raised in Toronto, where he continues to live with his family. Up-and-coming illustrator MADELINE KLOEPPER, a graduate of Emily Carr University of Art and Design, brings wise-beyond-her-years illustrations full of sweetness and curiosity to her debut picture book. Madeline grew up in the lower mainland of British Columbia amidst a sea of humans and spent a few years in Vancouver; she has since migrated northward to Prince George. Her work is influenced by childhood, nostalgia and the relationships we forge with nature, no doubt inspired by her love of exploring the Pacific Northwest.